A line scrawls along the board, connecting two dots. Another line is drawn, completing the set! What's the next move? What's the next move? Should the player go upper right or lower left, where will he go? Will he be able to write his initials in the box, or be boxed out and have to settle for second place. Pretty soon this will be a common scene playing out all throughout America as the Worldwide Dots and Boxes Federation launches this Fall on ESPN. Also known as “The Line Game” and played by just about everyone capable of drawing either lines or dots, this brand new sport promises all the thrill of line game, with none of the overpaid players and steroids of real sports. A quick primer on standard Dots and Boxes gameplay. A 6x6 grid of dots is drawn out. Players take turns drawing lines until they form a 4-sided box. And then BAM! Box game. played on the back of a Netflix envelope. This might seem like an odd statement, however recent discoveries out of Egypt show the system of hieroglyphics once thought to symbolize words, numbers and communication actually came about as a rudimentary form of this grand game. And it has continued on past dead pharaohs to become one of the hottest international hits. From the Prime Meridian to, well, the Prime Meridian, everyone knows Dots and Boxes. “This game is just so universal. 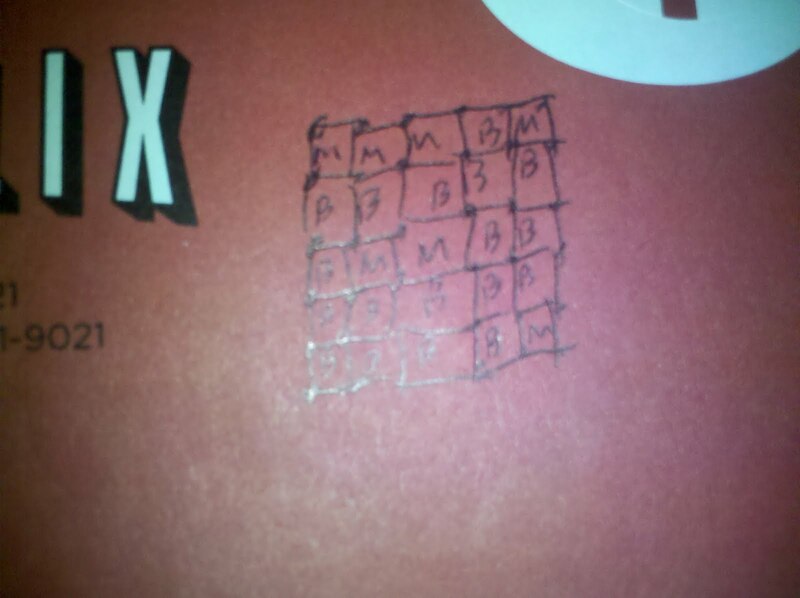 Sit down next to anyone in any culture and draw that 6x6 grid. Take the first move and hand it to them. As long as they're not from a former Iron Curtain country or Mississippi, they'll know exactly what to do next,” says Jefferson. The superstar players of the WWDaBF are certain to make numerous appearances throughout the season. Don't be surprised if Marty “Bam Bam” Raumstein squares off against Bruce “The Praying Mantis” Hartigan for another one of their epic battles. “I remember the last time I played Bam. I think it was Raumstein v. Hartigan IV. I was all like 'Oh, you want to put your line there, eh? Well, I put my line here! And I take that box! And that box! And that box! I will now add my initials to those boxes with pleasure.' It was intense,” says Hartigan. “What's going to revolutionize this whole concept is our new camera located inside the pencil. This way viewers can see the lines form as they hit the table. No need to wait for the instant replay or dramatic recreations—but we will have those too,” says Jefferson. The inagural season will feature 50 intense matches, played out over how long is necessary to determine a winner. The average match runs three hours, but several have dragged on for 12 hours. When every line is an agonizing decision, the drama of selection becomes an intense and enduring decision. The Worldwide Dots and Boxes Federation will air Wednesday through Monday at 7pm every night starting September 13. Of course, there will be no shows on Tuesdays, because that's a nigh-religious day for Dotters worldwide as they contemplate the fate of their existence.